Ladies and gentlemen, Bum Wine Bob has finally made it to the big time! I have the esteemed honor and privilege of being featured by Matt and Jay over at IWS Radio as their IWS Person of the Week! Thank you guys! Be sure to go and check it out! What's the word? Thunderbird! 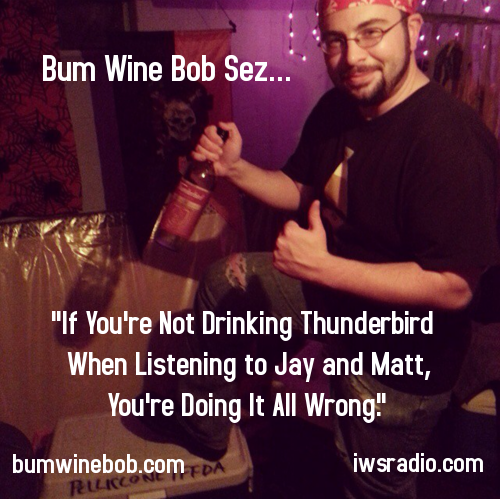 Did you miss Bum Wine Bob's appearance on the IWS Radio show? You can listen at the link here or listen to the show below! I make my appearance at the 94:00 mark. Enjoy! You rocked it dude! Great job and thanks! Thank you guys for having me on! I had a blast! Hopefully we can do it again! I'm still drunk from the experience.